Please note that the trucking company will not make inside deliveries. It is the customer’s responsibility to transport flooring from the truck into your facility. Please examine for any damages which might have occurred during transit. The flooring rolls should be resting on corrugated cradles and strapped/bound to an 8’ Pallet along with boxes containing tape and other flooring supplies including installation products and maintenance supplies. Check against the packing list or you sales invoice. If you have any questions about the condition of the flooring you have received or if the rolls have been removed from the pallet, please take multiple photos from different angles with good lighting and minimal glare, and contact your stagestep salesperson as soon as possible. If you see any evidence that shipment is damaged, you must note “Damaged” on delivery receipt. You can note specific damage as well but then you must be complete in your assessment. Upon receipt all rolls of vinyl flooring should immediately be removed from the 8’ pallet, inspected and stood up on a perfectly level floor or leaned against a wall in the most upright position possible. Failure to do so may result in deformation of the vinyl for which stagestep will not be responsible. Please look for the stagestep instruction manual attached to one (of the) roll(s) of vinyl flooring for further instructions. Stagestep cannot guarantee a date or time of delivery. We can and will give you our best estimate. Stagestep will provide you with the computer tracking number, the shipping date, ETA, and trucking company used for shipping. via interstate trucking and fully insured in the customer’s name. All claims must be made to the trucking company by the customer. 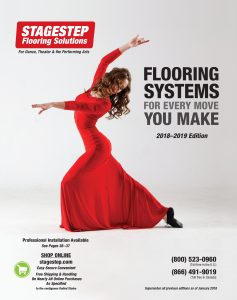 Stagestep is not responsible for costs related to the delay, damage, or installation of its flooring. Floors must be inspected for defects and dye-lot prior to installation. Any non-concealed damage to your shipment must be noted on shippingdocuments at time of receipt. Photo documentation should be sent to Stagestep to facilitate all claims. Upon receipt of shipment, vinyl flooring rolls must be removed from pallet and stood vertically immediately. We are not responsible for damage if this is not done. Installation of flooring denotes acceptance. Purchase orders accepted from city, state, and federal institutions and public school systems. Net 30 days. All other orders must be prepaid. We accept credit cards (MasterCard, Visa, Discover, PayPal, and American Express), certified checks, and money orders for U.S. and Canadian currency. Checks can now be faxed as payment to expedite your order. We can also provide current exchange rate for foreign currency. Please note that truckers will not make inside deliveries. It is your responsibility to transport flooring from the truck into your facility. Flooring will be shipped FOB Philadelphia unless otherwise arranged. All other products will be shipped prepaid UPS or FedEx unless shipped with flooring via interstate trucking. All freight prepaid or C.O.D. For shipments outside the continental U.S., orders ship via UPS International or Federal Express. Please call for shipping cost. Stagestep is not responsible for installation costs (lost wages, reinstallation) resulting from damaged flooring due to shipping or manufacturer defects. Flooring is shipped via interstate trucking. Cost is determined by weight and distance. Stagestep will be happy to quote shipping costs. We discount all published rates. To order floorcare products or installation products, call 800-523-0960, during business hours or shop 24 hours a day online. † Shipping for most online purchases is free to the 48 contiguous United States. We charge for shipping for online orders to states outside of the 48 contiguous states. All claims must be made to the trucking company by the customer. In stock — 2 days to 3 weeks delivery depending on destination. Special orders take 3 to 10 weeks. RETURN POLICY: ALL RETURNS MUST BE AUTHORIZED. Customers must notify Stagestep either by email or phone within 72 hours of receipt providing a reason for the return. An authorization number will then be issued. Shipping is the responsibility of the customer. Product must be properly packaged. Returns are subject to a 15% restocking fee. Additional charges may be incurred subject to inspection. If merchandise is damaged due to shipping, customer must note same on Bill of Lading or receipt, or refuse delivery. Customer should immediately notify Stagestep and send pictures of the damaged packaging and/or product. An authorization number will be issued. Damaged products due to shipping will be replaced at no charge to the customer. In the case of a manufacturers defect, Stagestep will authorize return of merchandise for replacement at no charge to customer. Customers who want to return merchandise may do so after notifying Stagestep either by email or phone within 72 hours of receipt of merchandise. An authorization number will be issued. All Remnant and Close-out/Discontinued sales are final and non-returnable unless damaged during shipment. When you have little or no time between ordering your floor and your studio opening or upcoming performance, you can rely on the Stagestep Hot Rush Delivery Service. Ask a Stagestep representative for details. Expedited shipping is also available at an extra charge.